It’s 6 PM and you’re getting home from work. You walk into your home and flip the switch to turn on the lights, open the refrigerator to get something out for dinner, and turn on the TV to watch the news. All of that relies on electricity. But how often do we think about where that electricity is coming from? For at least half a century the average person has taken electricity for granted. Maybe we’ve had a vague notion that a power plant somewhere was pumping out those electrons; but unless we experienced an outage, we didn’t give our energy sources much thought. The fact is that until recently most of that energy was coming from coal, oil, natural gas or nuclear reactors. While nuclear has its own problems, the others pumped tons of CO2 into the atmosphere contributing to a steady and accelerating rise in greenhouse gas concentrations and rising global temperatures. Now that we have become aware of the effects of CO2 on climate change, we have taken steps to reduce our reliance on fossil fuels and transition to renewable energy sources. Vermont has become a leader in renewable energy, getting 40% of our electricity from renewables like wind, solar, hydro and biomass which includes wood and methane from landfills and biodigestors. More than 16,000 well-paying jobs have been created, the highest number per capita in the U.S., and hundreds of millions of dollars in transmission costs have been avoided by distributing generation close to where it is being used, thereby helping to keep Vermont’s electric rates the second lowest in New England. This accelerated growth of large-scale solar and wind has also resulted in pushback by those who focus on their effects on ridgelines, landscapes and neighbors. These growing pains are often caused by poor planning and communication by developers as well as a negative reaction to the aesthetics by some people. Unfortunately, any type of energy generation has negative consequences, and we need to keep in mind the degree of harm each type entails. While we may not want to see a farm field covered with solar panels or industrial wind on our ridgelines, they are nothing compared to massive oil spills, tar sands mining, or mountaintop destruction for coal. This past week we on the House Natural Resources and Energy Committee heard testimony from citizens and community leaders regarding the siting of wind and solar facilities. A common theme seemed to be that renewable energy is laudable, but needs to be properly sited and scaled down. For example, a 500 foot tall wind turbine a half mile from a residential development is not acceptable. Moreover, towns would like the Public Service Board to give more consideration to their town plans and zoning regulations. While the Vermont Senate is currently developing legislation addressing these issues, my committee is preparing to weigh in once the bill comes to us. Threading this needle won’t be easy. We want to retain the broad public support for renewables and continue to grow this important part of our economy. We want to give town government an appropriate role. I believe we can have large scale wind with minimal impact to our ridgelines and communities if they are properly located. We can have large scale solar that benefits farmers and communities. And we can continue to build out residential and group net metering that will benefit consumers, make the electric grid more reliable, and reduce the greenhouse gas emissions that drive climate change. We just have to find a reasonable compromise. First, here’s an update on effects of the spending cap or threshold on school budgets in Act 46. Action to address this is progressing in both the House and Senate, although the approaches are different. Whether the spending threshold is increased by 0.9%, as proposed by the House, or whether they are repealed altogether, as proposed by the Senate, will probably come down to a compromise which will be decided in a conference committee of both bodies. For example, if the Legislature sets the goal of treating all persons addicted to opiates and allocates money for the program in the budget, the RBA metrics would include how many addicts got into the program, how many were successfully treated and at what cost, how many reintegrated as productive members of society, and how many seeking treatment couldn’t be accommodated. Following this model the Department of Environmental Conservation asked its employees what could be done to increase the efficiency of its operations. One division of the department had a backlog of 1100 drinking water and pollution control project audits. They estimated that it would take more than 100 person years to resolve the backlog using the existing audit process. A new approach was needed to tailor the level of audit to the level of project risk and streamline the process. The Commissioner at the time, David Mears, charged his team to analyze the process and come up with suggestions for improvement. As a result of this exercise dozens of iterative steps were condensed to a few necessary ones while retaining the effectiveness of the audits. The changes resulted in a 76% reduction in the backlog, which is on target to be eliminated by March 2016, an increase in job satisfaction for the employees involved, a savings of $1.6M returned to the State Revolving Fund, and the ability to reallocate some personnel to unfilled positions in other areas. This success and similar ones in the Agency of Transportation serve as a model for other agencies of state government. The Legislature hopes that continued attention to Results Based Accountability will help state government become more efficient, save taxpayer dollars, and help us get a better handle on the state budget. I continue to welcome your comments and can be reached by phone (802-233-5238) or by email (myantachka.dfa@gmail.com). The first week of a legislative session features a joint session of the House and Senate called to hear the Governor address the state of the State. 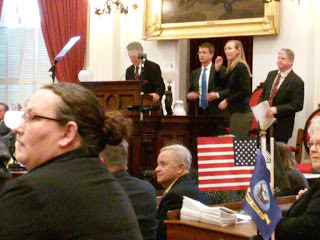 Amid the formal ceremony in the chamber of the House where the members of the Senate sat in their special seats near the podium, distinguished guests sat in additional chairs in the center of the well of the House, and other special guests sat among the members of the House and in the balcony, Governor Shumlin gave the last state of the State address of his six year tenure. He made note of many accomplishments including a renewable energy policy that has grown thousands of new jobs while holding down electric rates, a strong and successful response to tropical storm Irene, success in getting 16,000 Vermonters health insurance they didn't have before, refocusing the criminal justice system from incarceration to rehabilitation, and expanding access to higher education for Vermont students through various innovative programs. On a lighter note, he touted the successes of the micro-brew, cheese and local food movements. Looking to the future he focused on the economy, education and marijuana legalization among other things. He said he is looking forward to signing the Paid Sick Leave bill, which passed the House last year, is expected to pass the Senate early this session. He announced a $1 million grant from the Enterprise Fund to Global Foundries to make 100 temporary jobs permanent. And he called for quickly postponing or repealing the caps on education spending enacted in Act 46 last year. This approach is in contrast to the direction proposed by members of the House to raise the cap by 0.9%. I was pleased to see that the Governor stipulated five criteria before he would sign any legislation legalizing recreational marijuana: 1) the market must keep it out of the hands of kids, 2) it must be taxed low enough to prevent a black market, 3) revenues must be used to expand addiction programs, 4) there must be a way to detect driving under the influence, and 4) it should include a ban on the sale of edible marijuana products. These criteria are necessary but, in my opinion, there should also be a detailed analysis of the experiences of Colorado and Washington regarding the increased usage, especially by teenagers, and the additional costs to society as a result of DUI, marijuana tourism, and the use of other drugs accompanying marijuana use. The Governor's focus on addressing the opiate crisis remains unabated. He harshly criticized the FDA for approving stronger pain killers and the use of Oxycontin for children and denounced the pharmaceutical industry for transforming “compassionate pain management” into “pain for profit.” He proposed limiting prescriptions for opiate pain medications after minor procedures to 10 doses at a time, increasing the periodic drug take-back events, and expanding the use of the prescription drug monitoring database to physicians and pharmacies in nearby states to reduce cross-border abuse. Finally, I am proud that he continues to support accepting refugees from the civil war in Syria who pass the extensive and lengthy background checks by UNHCR and our own State Department. As this past Sunday's Doonesbury strip noted, why should a potential terrorist go the refugee route when it is easier to just get a tourist visa? Our country must continue to show compassion to those genuinely seeking shelter from terrorists rather than creating a fortress mentality. After all, we are “the land of the free and the home of the BRAVE,” are we not? Appearing on the Chittenden County Democrats Show, Conor Casey, Executive Director of the Vermont Democratic Party, discussed the outlook for 2016 for legislative work and the prospects for Democrats in this election year with hosts Bob Hooper and Rep. Mike Yantachka. The interview was recorded on January 4, 2016, at the CCTV studio in Burlington. The second session of the legislative biennium began on Tuesday of this week. Once again we are faced with fiscal year expenses that exceeded revenues and require some adjustments to the budget. Fortunately, revenues came in a little better than expected, but were outpaced by increases in Medicaid expenditures. The Appropriations Committee has already been taking a close look at areas where spending has not been as high as projected and is looking for money to move around to fill the Medicaid gap. The ability of the Joint Fiscal Office and the legislature to predict the state’s financial picture continues to be inadequate despite our best efforts last year. It appears our crystal ball needs an upgrade. While the budget adjustment is a high priority, the effects of Act 46, the Education Reform Act, are even more pressing. The caps that school boards across the state are facing on per-pupil spending increases have been greater than anticipated. This is especially affecting school districts that are continuing to experience declines in student population. In CSSU Charlotte, Williston, Hinesburg, and CVU are in this situation. Charlotte will be assessed a significant penalty unless it can reduce its budget by more than $500,000 under the current formula. The repercussions throughout the state have caused the House and Senate Education committees as well as the Governor to work on changes that will mitigate the impending pain. Since school boards have to settle on a budget recommendation by the third week in January, the legislature must act within the first two weeks on this. There are three proposals going into the session. The House Education Committee’s bi-partisan proposal is to increase the cap from 1.48% to 2.38%. This would make the required spending reduction for Charlotte a more manageable $53,000. The Governor is recommending that the caps and penalties be suspended for a year to allow more districts to consider and vote on consolidation. Since the purpose of the spending caps and penalties was to give a push for consolidation, it makes sense to allow time for consolidation studies to be completed and, if appropriate, be presented to the voters. The Senate’s proposal is to scrap the Act 46 caps and revert back to the pre-Act 46 spending caps and penalties. This issue will be a major news story, so watch the news and you will know the outcome as soon as I do. I look forward to publishing my weekly reports in our local papers throughout the session, altenating between The Charlotte News and The Citizen, to keep you informed. I also welcome your comments and can be reached by phone (802-233-5238) or by email (myantachka.dfa@gmail.com). Matt Dunne, former State Senator and now candidate for Governor, was the guest of Rep. Mike Yantachka on the Chittenden County Democrats Show, aired monthly on CCTV, Channel 17 in Burlington. This program was recorded on December 7th. 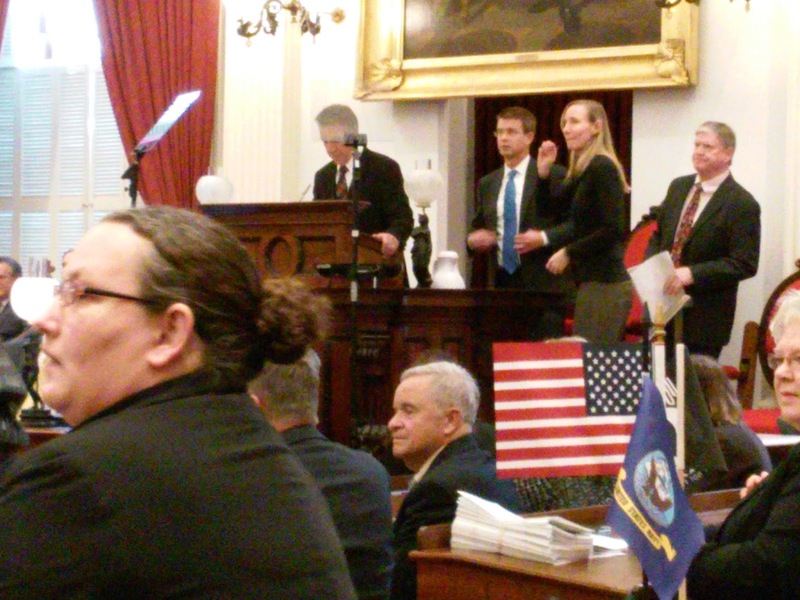 Dunne spoke about his candidacy and vision for Vermont's future. He is the first candidate in the 2016 election cycle to appear on the show for a contested statewide office in the Democratic primary election which will be held in August. (The Presidential Primary election is separate and is held on Town Meeting Day, the first Tuesday in March.) Other Democratic candidates will appear on the show in coming months. The interview with Matt Dunne can be seen here.